Poetry Book Society Recommendation, Summer 2018. Is nowhere a place we can get closer to? In her compelling second collection, Alice Miller tackles the circularity of thought, the company of the dead, and the lure of alternative futures. These poems rip into pockets of histories, trying to change facts and voices, searching for the word’s version of music’s home key. They dare you to visit, through a series of cities, the futures we never let happen. 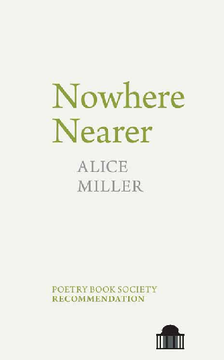 Alice Miller is a New Zealand writer living in Berlin. She is the author of 'The Limits' (Shearsman & Auckland University Press). Alice is a graduate of the Iowa Writers' Workshop and the International Institute of Modern Letters. Her work has appeared in 'Boston Review', 'Oxford Poetry', 'Poetry London', 'The Rialto', and 'The American Scholar'. She has received the BNZ Katherine Mansfield Award, the Royal Society of NZ Manhire Prize, a Glenn Schaeffer Fellowship, and has travelled to Antarctica courtesy of Antarctica NZ. She has also been a resident at the Michael King Centre, Massey University, the Grimshaw Sargeson Centre, and the Akademie Schloss Solitude. 'Blaue Stunde', an edition of her poems with a German translation, was published by Edition Solitude in 2016.